Sirhan, the man almost everyone believes killed Robert F. Kennedy (and did so alone), is seeking a new trial. Sirhan’s current attorney, William Pepper, who also served as James Earl Ray’s final lawyer and believed that Ray had been set up, is seeking to convince the US District Court for the Central District of California not to accept a report from a magistrate judge, Andrew J. Wistrich, advising that the new trial request be dismissed. It’s up to the district court to decide whether to proceed. Although Sirhan pled guilty at his original trial in 1969, Pepper contends that Sirhan was betrayed by a lead member of his original legal team, Grant Cooper, who Pepper notes was himself under federal indictment at the time for illegally possessing grand jury proceedings in another famous case, involving card cheating at the Beverly Hills Friar’s Club. Cooper, who faced possible jail time for that, ended up being let off with a $1000 fine. Intriguingly, his client in the Friar’s affair, John Roselli, was an organized crime figure with CIA ties often named as a possible conspirator in the death of President John F. Kennedy. The defense had Sirhan admit guilt and sought to portray him as both mentally deficient and acting on impulse. Pepper notes that the attorney’s personal vulnerability was known to the judge and prosecution, and that they nevertheless said nothing while Sirhan’s real interests were not represented, and exculpatory evidence was suppressed. Although Sirhan confessed to shooting at Robert Kennedy, he later said that he could remember nothing at all of that tragic day. Pepper and his experts believe that Sirhan was selected to be the patsy in RFK’s death, distracting everyone while a professional assassin fired the fatal shots unobtrusively from inches behind Kennedy—from a crouched position in the crush of people so his actions would not be noticed, milliseconds after Sirhan shot and missed and was immobilized. Pepper’s key argument is that Sirhan, by all accounts, was positioned several feet in front of Kennedy (who was moving toward him), while forensic evidence and extensive eyewitness testimony shows that Kennedy was actually hit in the back from just inches away. This recitation of the activity leading up to the shooting is a virtual admission of Petitioner’s innocence since Senator Kennedy was hit by three bullets, fired in an upward angle (indicating that the shooter may have been kneeling behind the Senator) from behind him, by a weapon pressed up against his back with the fatal shot fired about an inch behind his right ear. All shots left powder burns on the back of his jacket and on his skin behind his right ear. The Report explicitly acknowledges, along with the statements of twelve eye witnesses, that Petitioner was, at all times, in front of the Senator, where, as the Report confirms, the Petitioner could have shaken hands with him. Petitioner questions whether further comment is necessary in light of this embarrassingly absurd factual foundation for the recommendation that the Petition be dismissed. The sounds on that tape, when analyzed with a computerized technology not available at the time of the assassination, clearly reveal that thirteen shots were fired, coming from two different directions –west to east and east to west. The magistrate has criticized Sirhan’s team for not bringing the tape forward earlier, since it has been available since 1988. But Pepper says that this is an absurd objection since the technology to analyze the sounds on the tape only became available in 2005. In arguing against a new trial for Sirhan, the magistrate cites competing “naked ear” analyses of the tape by “experts” who did not have access to the computer program. Pepper, in turn, casts doubt on the ability, motive and track record of one of those “experts”. The fact that at this late date we still can’t agree on what happened on June 5 goes back to the very beginnings of the case. If Sirhan had been represented by capable attorneys determined to learn the truth about the politically fraught second murder of a Kennedy brother in five years, things might have turned out differently. Instead, his attorneys persuaded Sirhan to plead guilty in hopes of avoiding the death penalty; Sirhan put up no resistance to this strategy since, as he would later reveal, he had zero recall of what happened on the night of the shooting. He was sentenced to the death penalty anyway, though several years later the sentence was commuted to life in prison after California abolished the death penalty. As a matter of record he accepted, without even the most perfunctory examination or challenge, all of the State’s ballistic evidence…. As a result, defense Counsel Cooper’s indictment [for illegally possessing grand jury proceedings in another case] went away. He was rewarded for obtaining the guilty plea and death penalty sentence…. It takes a moment to realize that this is not the prosecutor, but the defense lawyer. No wonder most of us take for granted that Sirhan Sirhan killed Robert Kennedy—and acted alone. Throughout his closing argument, Petitioner’s Trial Counsel never lost an opportunity to praise the prosecution’s case and the prosecutors themselves. He, continually, strangely, elevated them, and the prosecution’s case in the jury’s eyes. Pepper, who first filed for a new trial in 2011, wants the chance to present a court with his new evidence: the Pruszyinski tape, impartial eyewitness accounts, (i.e., all twelve witnesses who say Sirhan always was in front of the Senator), and other evidence, including testimony from Dr. Daniel Brown of Harvard, a specialist in hypnosis and trauma memory, who has spent more than 70 hours examining Sirhan since 2008. Among the intriguing elements the magistrate did not mention in his report: some question exists about the original trial evidence—which is crucial to establishing whether Sirhan was the assassin or whether someone else killed Kennedy. Indeed, Sirhan’s trial counsel did not ask the Los Angeles County Medical Examiner to confirm that the bullet slug presented as evidence was the same one he removed from Senator Kennedy’s neck. At the time of the autopsy, the examiner had marked the slug “TN31.” In the intervening years, Pepper says, Sirhan’s defense has learned that the slug introduced during the trial appears to have had the mark “DWTN”—suggesting it was not from the same gun. One witness, Karl Uecker, a maître d’ at the hotel, was leading Kennedy by the hand through the crowded pantry. After Kennedy stopped to shake hands with a dishwasher, Uecker again took him by the hand and began moving forward. It was while they were on the move that Uecker heard a shot, saw Sirhan in front of him, grabbed for the gun and forced Sirhan onto a steam table. So, according to the magistrate’s Report, Sirhan somehow got several bullets into Kennedy’s back from close range and the fatal bullet into the back of his head—even though Uecker himself was between Kennedy and Sirhan, and Uecker asserts that at no point could Sirhan’s gun have been closer than a foot-and-a-half from Kennedy. The magistrate, having accepted that Sirhan’s hand was pinned to a table soon after several frontal shots missed, asserts that he nonetheless was able to get off the successful rounds from that position. The scenario put forward by the Report is errant nonsense. It is embarrassing to say the least and though it may have been due to the Magistrate’s reliance upon uninformed Clerks, it should not see the light of day, much less be submitted to the habeas Judge. The question remains as to who fired the other three previous shots at close range from the rear. Once again, the Report ignores this critical fact. Significantly, Pepper brings in the recent testimony of Nina Rhodes-Hughes, who says that Kennedy was not turned around, but was facing forward, when the shots were fired. Rhodes-Hughes is certain there was a second shooter. I’ve discussed the case on several occasions with Pepper, as well as with former union official Paul Schrade, who was walking six to eight feet behind Kennedy and was himself wounded by a stray bullet. Schrade insists, and told the FBI at the time, that Kennedy was facing Sirhan when the shooting began. The Sirhan case was always, on the surface at least, open-and-shut. As if being apprehended with a gun at the scene wasn’t enough, police found Sirhan’s highly incriminating diaries, replete with declarations that RFK should die. But some wondered whether he wasn’t too textbook-perfect a culprit. Indeed, the cumulative evidence that has come out over the years suggests that things were far more complicated. Witnesses saw Sirhan with a woman in a polka-dotted dress; she was seen fleeing the scene, and heard to brag about having participated in the Kennedy hit. A man also was seen fleeing, gun in hand. And of course there was all that evidence that Sirhan could not have fired the fatal shots. The clincher was Sirhan’s amnesia. What could that be about? As for Sirhan’s ranting in several spiral notebooks, some experts came to wonder if he had produced them while in a hypnotic state. In 1969, in the presence of several experts/witnesses, Sirhan, under hypnosis, engaged in “automatic writing.” After he was awakened, he remembered none of it. This leads us to the recent work of Daniel Brown, a Harvard psychologist. 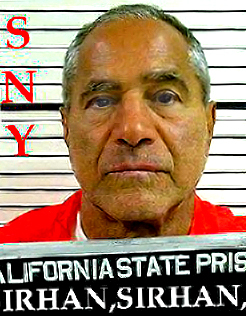 Based on having spent more than 70 hours interviewing Sirhan at Pleasant Valley State Prison in California, Dr. Brown has concluded that, for some time prior to the events at the Ambassador Hotel, Sirhan had been hypnotized—and not just hypnotized but “hypno-programmed”. Brown concludes that the widely believed assertion that Sirhan was schizophrenic is incorrect—and two prison psychologists concur with that opinion. Instead, Brown has identified Sirhan as uniquely suited to mind control, one of the very small minority of the public deeply susceptible to programming. Brown further suspects that Sirhan was subjected to a combination of drugs, hypnosis, sensory deprivation, and suggestive influence. It’s interesting to note that two years before the Kennedy killing, Sirhan had fallen from a horse, and saw at least nine doctors over the next 15 months. Much of Sirhan’s activity in the year before the assassination remains murky to this day. Under hypnosis by Dr. Brown several years ago, Sirhan recalled a sort of handler with a distinctive mustache who spoke with a foreign accent. He also remembered going to a gun range to learn to shoot at vital human organs. A police report actually corroborates Sirhan being at that same gun range with a man of exactly that description. Although it would seem to Sirhan’s advantage to provide Brown with the recollections he produced, clinical hypnosis doesn’t work that way. In recent years, Dr. Brown was able to repeat the experiment with “automatic writing” and go much further with this research. Among other things, Brown learned that Sirhan had been a ham radio enthusiast, going on air nearly every evening prior to the assassination—and would often enter a hypnotic state while doing so. This gave rise to the possibility that Sirhan received hypnotic suggestions via short wave radio. In a test, Brown was able to get Sirhan, while in a trance, to write incriminating things—which he denied writing when out of the trance. Will the [district court] accept the magistrate’s report and quash the request for a new trial? Or will we see a break in the case? As my French colleagues, who have reviewed this file say—Les jeux sont faites. The game is up. But is it? The judge handling the case will presumably be under intense pressure not to permit a new trial. Consider the Pandora’s box that could open. If the public were to learn to distrust the official version of yet another assassination that changed the course of American history, where would this all end? Before long, people might wonder what happened to Martin Luther King, to labor leader Walter Reuther, to all of the leading lights that were extinguished one after another in the last century. It will take the active interest of the public and the media—and some improbable heroism on the part of the latter—to keep up the pressure until “justice” becomes more than just another word for blind acceptance of the government-sanctioned status quo. There are 64 comments Our Comment Policy: Keep it civilized, keep it relevant, keep it clear, keep it short. Please do not post links or promotional material. We reserve the right to edit and to delete comments where necessary.